Niagen Reviews | Does it Work or Scam? 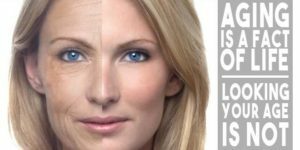 Niagen is a dietary supplement which stresses that it is a product resulting from the latest scientific discoveries, promising revolutionary anti-aging effects. This Niagen review aims to provide a perspective that is as far from dazzling testimonials and scathing reports as can be. We will assess the claims of the manufacturer(s), an undertaking which we will see that can be quite problematic, then we will take a look at the short but rich history and also the latest news on Niagen’s fundamental ingredient, nicotinamide riboside (NR, for short), and wrap up the review with our verdict that takes into consideration existing testimonials and sensible prognoses regarding the not yet unearthed potential of NR. Cornucopia, the Fountain of Youth or the Holy Grail are mythical representations of an inherent human need – exploring some dimension of infinity. It could be argued that humans strive to achieve it whenever they find themselves at the top of any field of activity. At the particular intersection of science and consumerism, we can find products that aim to deliver the same tingling promises the three aforementioned symbols are said to have influenced our ancestors. Nevertheless, we are confronted with the extra dimension of novelty to add to the feeling of perpetuity those symbols entail. First of all, we should state that nicotinamide riboside was discovered in 2007 as a biological compound in its own right, therefore it is quite new to the whole of human knowledge, not just for the market of dietary supplements. There are many companies that commercialize supplements containing NR, however, the actual process of manufacturing NR is restricted to ChromaDex, a company dedicated to scientific research which can develop new technologies for pharmaceutical products, dietary supplements and the like. Their official website states that they are a publicly traded company, listed on Nasdaq, and their portfolio of innovations in the field is quite impressive, with compounds such as pterostilbene or cyanidin-3-glucoside. What this company does basically, is acquire patents for these substances, then it registers a commercial name for them (e.g., Niagen for nicotinamide riboside, pTeroPure for pterostilbene or ProC3G in the case of cyanidin-3-glucoside). Their final role in the commercial chain is producing the raw substance and selling the right to the use of their products to other manufacturers, which in turn, create the final product that can be found on the market. Some of the companies at the end of the chain just encapsulate ChromaDex’s products, others include it in their own particular concoction, but the main difference between what is available for the customers is just the dosage. In the case of NR, the company that is best known for manufacturing supplements is Live Cell Research, a California-based outfit that even uses the designation Niagen, the commercial name for nicotinamide riboside. 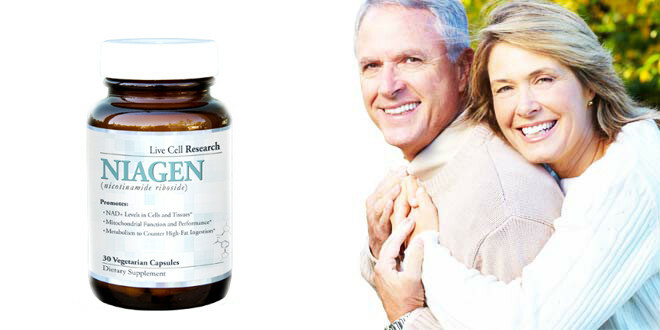 Niagen is just one supplement that Live Cell Research manufactures in their line of anti-aging products that supposedly takes advantage of the latest scientifical breakthroughs in the field of cellular biology. The company’s Niagen pitch works in the same manner, beginning by referring a 2013 study which found that NR is an integral substance in the production of NAD+ (more on it later on), a compound which can be found in all cells and acts as a messenger between the nucleus of the cell and the mitochondria, structures that can be found in all cells and are responsible for the chemical reactions which result in providing the cell with its necessary energy. It seems that improving the communication between the nucleus and the mitochondria is an essential and never before known part of slowing down the aging of cells. The simple sequence is: more NR leads to more NAD+ leads to less cell degradation. The 250 mg dosage of NR, advised to be taken once daily, on an empty stomach right before the first meal of the day, promises to improve your overall levels of energy, better memory and a clearer head throughout the day, improved muscle mass and strength while also working towards a better-equipped immune system. The supplement sold by Live Cell Research is a wholly vegan concoction, containing no dairy, gluten, caffeine, preservatives or synthetic other additives. A little background on foods that contain nicotinamide riboside, although being a precursor of vitamin B3 there is a chance that traces of NR can be found in any foods exhibiting amounts of vitamin B3. Assertions of the virtual lack of side effects (or lack of interference with other medication or dietary supplements) backed up by a reference to a 2007 study on the matter. One could argue that considering NR was discovered around the same time as this study, the implications of NR’s effect on humans (particularly concerning the dosage) were just beginning to be fathomed. The fact that Niagen can help individuals of all ages who are experiencing a marked lack of energy or chronic fatigue, with the undertone, that the main target is the elderly. 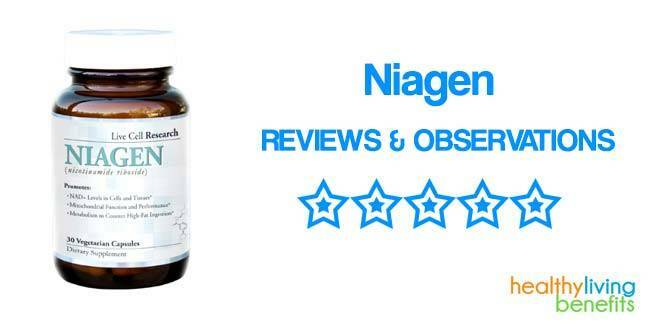 Below the section dedicated to the product’s description, there is a never-ending roster where “individuals” of all ages (from 23 to 92 at first glance) share their positive experience of Niagen, all of them providing a five-star rating to Live Cell Research’s supplement. Some would point out that even Stalin was content with a 99 percent approval. 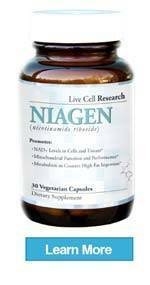 To put things in context, we should mention that Niagen is but one of the supplements marketed by Live Cell Research. Boasting insight on the workings of cellular and genetic research, one can purchase from their website LA-3 (a supplement meant to activate the AMPK enzyme in cells which boosts the conversion of fat into energy), Nervestim (a product that aims to improve nerve function through the wondrous effects of the Chinese mushroom also known as Lion’s Mane), Advanced Joint Repair (whose purpose is evident, being delivered through a rather peculiar mixture of ingredients), Advanced Adult Probiotic (from an initial evaluation, a classic probiotic supplement), Pro Krill 1000 (a potent omega-3 acid supplement exploiting the titular crustacean’s properties), Midogen (a resveratrol supplement which stimulates mitochondria), Cerastim (a concoction of five different nootropic substances), and Vital Stem (a supplement centered on a large amount of vitamin D3 which aims to proliferate adult stem cells). It certainly is an impressive portfolio. Aside from the problem of dosage, it is clear that the feasibility of Niagen revolves around the effects nicotinamide riboside can have on the human body. The story starts with research concerning nicotinamide adenine dinucleotide (or NAD), a coenzyme that can be found in all the cells of animals. At the biochemical level, NAD is a carrier of electrons between reactions of oxidation, where diverse chemicals from nutrients react with oxygen resulting in cellular energy. In the metabolism, NAD has two forms – NAD+, which is the oxidizing agent in the reaction proper, and NADH which results from the process. This crucial biochemical process was described for the first time at the beginning of the 20th century by British scientists William John Young and Arthur Harden through experiments involving effects of certain yeasts in the pace of alcoholic fermentation. Throughout the 20th century, the intricacies of this process were discovered gradually, with the developments culminating in the 2004 discovery of a vitamin B3 precursor, nicotinamide riboside, as playing an important part in the biochemical synthesis of NAD+. Charles Brenner is usually credited with the definitive conclusion that human cells, like some yeasts, have the property of using NR in the development of NAD+. The presupposition on which Niagen made its name was made public in late 2013 when noted Australian geneticist and Harvard professor David Sinclair, along with a team of researchers from the University of New South Wales, released their results from an experiment on mice which featured injecting them with nicotinamide mononucleotide, a substance that increases NAD levels, just like nicotinamide riboside. Dr. Sinclair was already a household name in the anti-aging business, due to his experiments of almost a decade earlier concerning the antioxidant effect of the polyphenols from red wine. His studies argued, with success, we might add, that resveratrol (found in but not limited to red grapes) has the same restrictive effects on aging as the reduction of calory intake. The essence of the NAD+ argument concerns the process through which mitochondria use oxygen and fuels from nutrients (such as glucose) to produce energy. As cells age, their mitochondria produce less and less energy (in the form of NAD) and, eventually, they shut down. This decline in the output of energy results from dysfunction in the nucleus-mitochondria communication. The experiment undertaken by Dr. Sinclair and his team involved 2-year old mice which were injected for a two-week period with the NAD precursor nicotinamide mononucleotide. Tissues from those mice were then inspected to find out that their composition resembled that of 6-month old mice. While that may not seem too relevant for human beings, the door of potentiality had been opened, with Dr. Sinclair’s team continuing experiments with NAD+ and its precursors with the aim of inhibiting the development of chronic diseases in mice. In the wake of the hype caused by this discovery, ChromaDex, the company which was already manufacturing nicotinamide riboside and marketing it under the Niagen name, tried to seize the mediatic opportunities by initiating the first “serious” test regarding the influence of nicotinamide riboside on humans. As a side note, we should note that ChromaDex also possesses some impressive scientific credentials, with their scientific advisory board boasting names such as Nobel laureate Roger Kornberg. This first study on humans (performed in early 2015) was also sparked by an earlier 2014 study conducted by ChromaDex on mice, which found that boosting the levels of NAD+ through the administration of NR had worked wonders in the case of rare age-related illness called Cockayne Syndrome. This premiere test was performed under the supervision of the aforementioned Dr. Charles Brenner, who acts as a consultant to the board of ChromaDex. As it was a preliminary test, their main aim was to find out the effects different doses of nicotinamide riboside would have on the human body and, particularly on the levels of NAD+ metabolites, levels that can be measured through blood and urine testing. Six healthy men and six healthy women were administered different doses (between 300 mg and 1000 mg) every day for a week in order to check the overall level of NAD+ and naturally to check for the possibility of side effects. The levels of NAD+ rose proportionally to the dose administered and no serious side effects were observed, even in the cases where the highest dose of NR was ingested. While this study could not have accounted for any potential benefits, the first steps towards a possible therapy involving NAD+ boosters in humans have been taken with this trial, an aspect accentuated by both Dr. Brenner and Dr. Kornberg by considering it a possible cornerstone in geriatrics. Brenner also stated that a long-term study of NAD+ enhancers’effect on patients with obesity, elevated cholesterol levels, diabetes and peripheral neuropathy would be a priority for the institutions involved in the preliminary testing. Several other tests have been undertaken in order to assess the potential of nicotinamide riboside and although they are not cited in order to back up the supplements containing NR, we believe they do have their degree of importance, that is why we will mention them here. Chronologically speaking, the results of the first important test performed involving NR were made public in the summer of 2012, a joint effort of Cornell’s Weill Medical College and Swiss researchers from the Polytechnic School in Lausanne headed by Dr. Johan Auwerx. Performed on mice, the experiment showed that mice injected with NR had the same metabolic benefits as another group involved in steady physical exertion coupled with a restricted calory intake regimen. The interesting fact is, if one digs a little deeper in the activity of this team of researchers at Cornell, they had previously discovered the current method of synthesizing nicotinamide riboside (from milk), patented it and sold the commercial rights to ChromaDex. As we have suggested in the title of this section, the history of NR supplements is a complicated one, with a host of actors, yet one that can always be traced back to ChromaDex. The potential of NR has not been overlooked by sports pharmaceutical researchers either. A recent paper, published in August 2016 in the Journal of the International Society of Sports Nutrition, describes an experiment on mice with a dosage of 300 mg per kilogram of body weight of NR and a group given a placebo, for a 3-week period. Results show that the group of rodents under the influence of nicotinamide riboside posted results that were 35 % worse for physical performance than the group that was given the placebo. 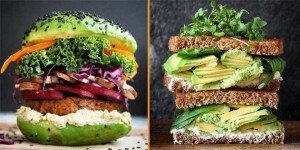 These results contradicted the initial hypothesis and opened a very realistic train of thought – altering the natural metabolism via external agents can have ambivalent results and, therefore we should not be getting ahead of ourselves in hailing certain products as revolutionary and truly beneficial. Indeed, as this comprehensive literature review iterates, there have been numerous benefits in laboratory conditions on rodents – a normalization in insulin production, protection of neural pathways or the neutralization of the pernicious effects associated with a high fat diet – these results should definitely not be extrapolated to humans, because all these experiments operate with a different dosage of NR and also because the biochemical pathways that raise NAD+ levels have not yet been sufficiently studied in both rodents and humans in order to definitely consider them identical. It is important to state that a large majority of online reviews of Niagen are positive. 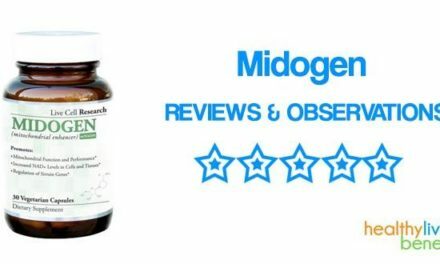 Even websites known for their skepticism and frequent scathing conclusions on dietary supplements take a balanced position while maintaining the doubts regarding Niagen as a possible agent in reversing aging. With the hype surrounding NR, it is truly a miracle that there is no significant polarization in the world of dietary supplement’s reviews. As we have pointed out in the first section of this review, the only major warning sign against Niagen is the clearly fabricated testimonial segment presented on the Live Cell Research website. 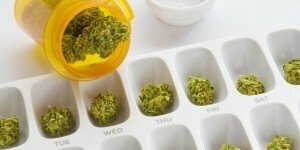 However, that is something to be expected (especially when a product is in its infancy) and we have not encountered a host of third-party websites that are too obviously an extension of the manufacturer’s marketing efforts, as is so often the case with other dietary supplements that are newcomers to the market. An interesting testimonial that can be explored here, follows the experience of a man and his friend who have experimented with different doses of Niagen, and while their results have certainly been encouraging for the optimists, it shows that different individuals react differently when exposed to the same doses of nicotinamide riboside, and there are no unequivocal paths yet to reap the benefits of NR supplementation. The convoluted history of nicotinamide riboside coupled with the important actors that are interested in producing and marketing supplements containing NR shows that it has the potential of becoming big business and it warrants further exploring. From the data available at the moment of writing, one should get seriously excited about Niagen only if one were a mouse. 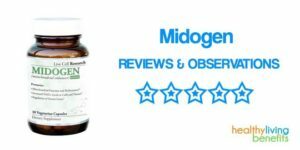 Keeping that in mind, there are probably worst ways of spending $50 on other dietary supplements, therefore if you are keen on performing seemingly innocuous experiments on your body and budget, you should definitely check out Niagen. It might work for you. Can I take with vitalstem? NIAGEN, should NEVER BE TAKEN BY ANYONE WITH ROSACEA. Be aware that all SIMILAR B-3 PRODUCTS will be dangerous.